1. Harvesting depends upon the purpose for which they are used. Four maturity stages are generally recognized. a. Green stage: The mature green fruits are generally harvested to send them to the distant market. b. Pink Stage: At this stage colour turns to pink or red at the blossom end. They are picked for local market. c. Ripe stage: At this stage surface of the most of the fruits is red and the soften of fruits begins. d. Fully Ripe: At this stage fruits have approached maximum colour development and are soft. Starch is charged into sugars. They are generally consumed or used for canning and processing. 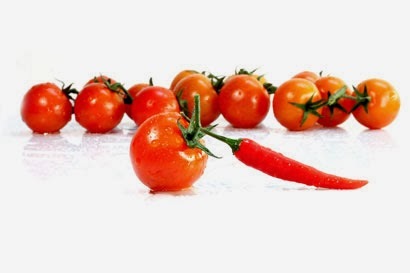 Depending upon the purpose for which they are used and market distance, tomatoes are harvested manually by plucking the fruits at different maturity stages. 1. Chillies are harvested at two stages, one for green vegetables and the other as dry chillies. 2. Green Chillies are harvested when they are fully mature and before they change from green to red. 3. Chillies for drying should be harvested when colour changes from green to red. Depending upon the purpose for which chillies are to be used, fruits are picked either green or fully red ripe.